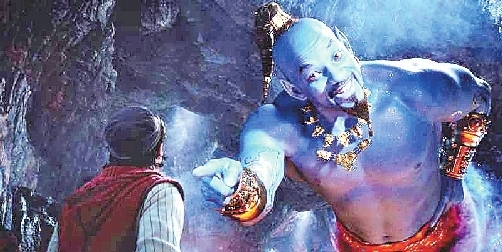 AS promised, Will Smith has granted fans’ wishes and has turned an interesting shade of blue for “Aladdin.” Too bad the fans aren’t that impressed. During Sunday’s Grammy Awards, Disney unveiled a new TV teaser for the live-action remake of its classic cartoon, offering a first look at Smith in action as Genie, the role brought to life in the 1992 original by the late Robin Williams. The minutelong spot offers brief glimpses of Aladdin (Mena Massoud), Jasmine (Naomi Scott), Jafar (Marwan Kenzari) and the other denizens of Agrabah in the Guy Ritchie-helmed musical, due out May 24, with Smith’s Genie crashing the party at the very end. Smith and Ritchie assured fans that Genie would be his big blue self once the film hit theaters. They were forced to speak up after an Entertainment Weekly cover story in December showed a pre-CGI Smith, which prompted Twitter blowback. Smith even tried to preempt criticism in an Instagram post. Despite the best efforts of Ritchie and Smith, Twitter wasn’t exactly thrilled with the reveal. Many users went straight to making an unflattering comparison between Smith’s Genie and Tobias’s Blue Man fail from “Arrested Development,” while others hoped for a do-over.